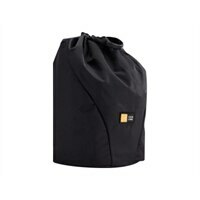 CASE LOGIC - Compact Camera Case with Storage - Black Accented with vibrant detailing and an additional pocket for storage this camera case is tailored to fit most compact digital cameras. Carrying options include a convenient belt loop or detachable lanyard. NITE IZE - Backbone Case Size #10 Small - Black Our Backbone Case Size #10 is the perfect size for small devices such as mobile phones small digital cameras portable GPS units and MP3 players. CASE LOGIC - Ultra Compact Camera Case - Black Accented with vibrant detailing this camera case is tailored to fit most ultra compact digital cameras with room for additional memory card. 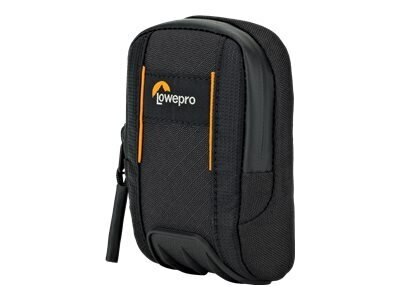 DAYMEN - Lowepro Adventura CS 10 - Carrying bag for camera The Adventura CS 10 pouch offers rugged protection for compact cameras with a custom-molded base and weather-resistant zipper to safeguard gear from moisture debris and impact. Ful - Shutter Bugger - Black The ful Shutter Bugger is a small camera pouch with belt loop compatibility. NITE IZE - Backbone Case Size #20 Medium/Tall - Black We made our Backbone Case Size #20 the perfect size for medium/small devices such as larger format digital cameras GPS devices two-way radios and mobile phones. Golla - Hollis Orange - Golla Camera Cases Digi bags are perfect for compact digital cameras allowing quick access playful colors and a detachable carabineer so you'll never miss a photo opp. Golla - Alfie Blue - Golla Camera Cases Digi bags are perfect for compact digital cameras allowing quick access playful colors and a detachable carabineer so you'll never miss a photo opp. Built - Hoodie Camera Ultra Compact Lush Flower - BUILT Ca Built NY's Hoodie camera case features dual material construction to keep your camera protected.
. - Cubik - Small Molded Compact Camera Case Compression molded protection for your compact digital camera with multiple attachment options. 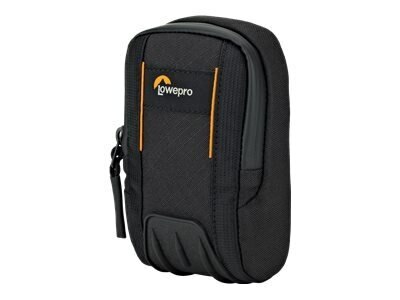 DAYMEN - Lowepro Adventura CS 20 - Carrying bag for camera The Adventura CS 20 pouch offers rugged protection for compact cameras with a custom-molded base and weather-resistant zipper to safeguard gear from moisture debris and impact.